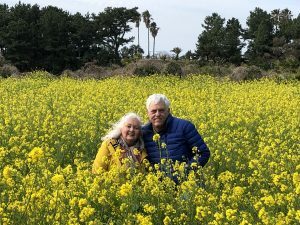 A visit to view the cherry blossoms on Jeju Island turned out to be much more than a look at the flora of the island. I’m always more interested in the people and their stories than I am the landscape. But, the landscape was spectacular. 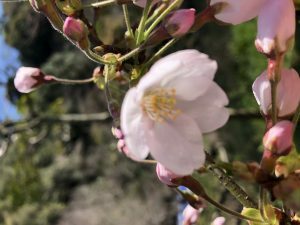 Here in Korea, they put out a forecast (kind of like our Farmers’ Almanac) predicting the optimal cherry blossom peeping times in different parts of the country. 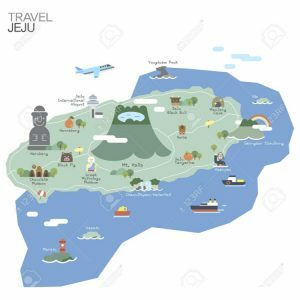 This past weekend was the predicted peak for Jeju Island. Since it’s our last weekend here until May, that worked just perfectly for us. 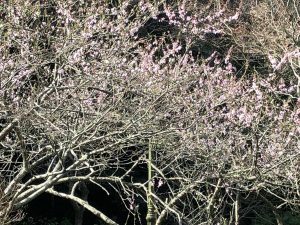 The cold weather, however, slowed the blooming, and the blossoms were not out in full force just yet. Not to worry. There were plenty of other things to see and learn. 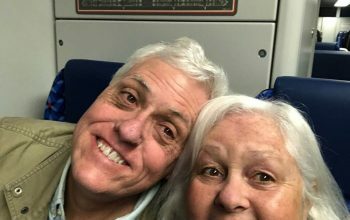 Our journey started on Friday morning, with an easy subway ride to Gimpo International Airport in Seoul. This is a smaller airport than Incheon (the big one that we use to fly from the States); kind of like Love Field in Dallas or Hobby in Houston. A casual check-in and even more casual security check took us to the gate, where we were the only non-Asian folks in the waiting room. We would be the only white people we saw all weekend. That is becoming our new normal. 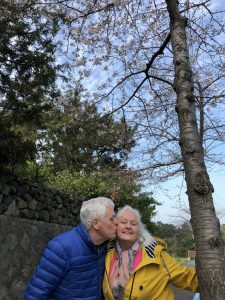 Our Korean friends are so kind and respectful (probably because of the very grey hair on both of our heads:)), that we feel very comfortable being in the minority for the first time in our lives. An interesting perspective. My heart melted as I watched a young Korean mother sing and play “head and shoulders, knees and toes” with her baby. Mack won’t admit it, but he got a little misty himself. Precious. 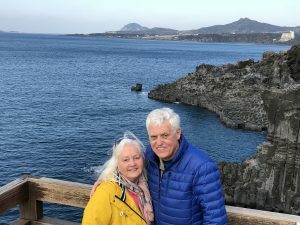 An easy hour-long flight landed us on the beautiful island of Jeju. 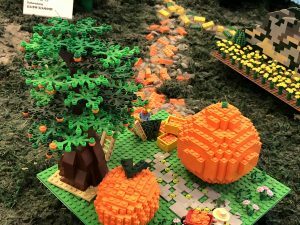 Instead of a paper map of the island, we were greeted with a spectacular Lego introduction to the attractions on our weekend getaway. Of course, that made us miss our little boys even more. 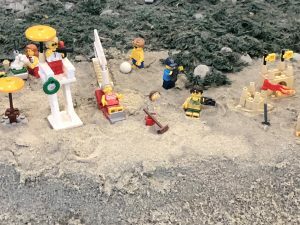 They are Lego lovers. 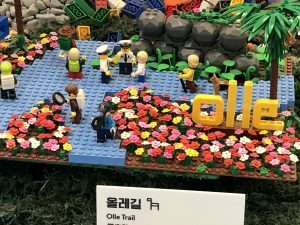 Jeju Olle Trail is a long-distance footpath on the island. 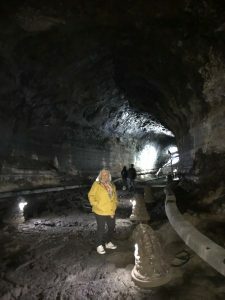 The route follows the coastline and consists of 21 connected and numbered trails for a length of about 250 miles. This past weekend, the Singapore International Walking group was on the island. A 45 minute bus ride took us to the far side of the island, where we checked in to the beautiful Hyatt Jeju Resort. 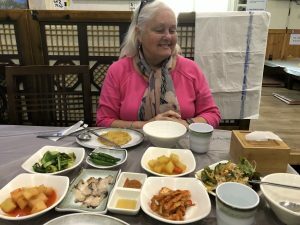 I felt a little wimpy choosing a Hyatt, but since this was our first jaunt in Korea, I thought we needed to play it safe and choose a familiar hotel. We will get more adventurous as we become more accustomed to the country. However, the Hyatt was right on the water and was spectacular. 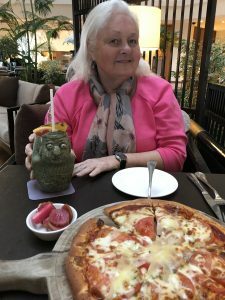 We hung out at the resort on Friday evening, having an early dinner overlooking the South Sea/Pacific Ocean. The water is incredibly blue – bluer and clearer even than the Caribbean of our beloved Playa del Carmen. 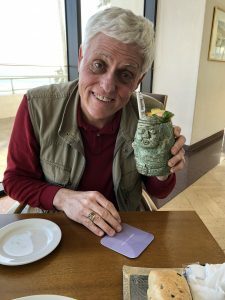 We ate those traditional Korean staples: club sandwich and pizza:) and had a delightful drink, something between a Mai Tai and Pina Colada, served in a stone cup, chiseled to look like the traditional “Grandfather” (harabang) rock statues. 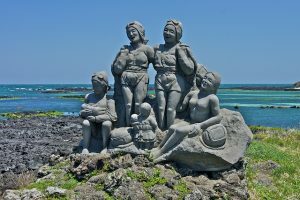 The statues, which are considered to be gods offering both protection and fertility, are found all across the island. 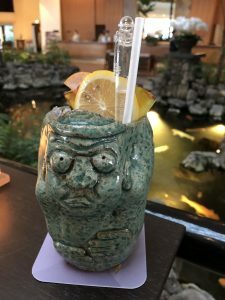 It’s worth a trip to Jeju just to give that libation a shot! On Saturday morning, we met our driver, who bowed deeply to us as he introduced himself as Mr. Kang. We had a list of several places that we wanted to visit on the island, but we were certainly open to Mr. Kang’s suggestions. 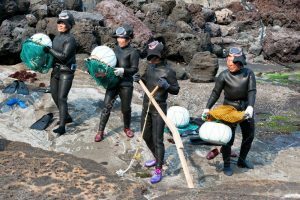 We were hopeful about seeing some cherry blossoms and I definitely wanted to see the Diving Women of Jeju. But, the weather was against us. 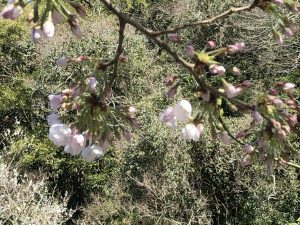 While we saw some cherry blossoms, the majority would not bloom for another week or so (according to Mr. Kang). So much for the official forecast! 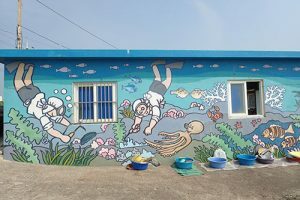 The wind was much too strong for the haenyeo to dive that day, but we drove by their huts and the statues erected in their honor. 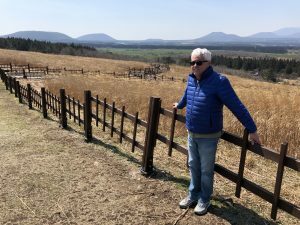 I read about the cultural heritage treasure (defn: something dying out that must be preserved – you might know that…I did not) of the Haenyeo in American Airlines magazine last year, shortly after we signed on for this Korean adventure. 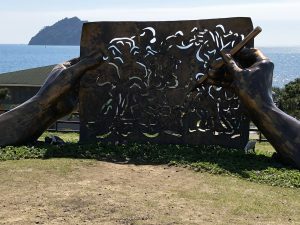 Fascinated by the matrifocal society created by the haenyeo, I was determined to make my way down to Jeju as soon as possible. 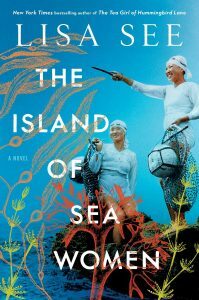 In that crazy way that life has of converging with art, when I arrived back at the hotel on Saturday night, I had a text from my sister, asking if I had read The Island of the Sea Women by Lisa See (who happens to be my very favorite Asian writer). It’s a book about the haenyeo of Jeju Island! By a strange coincidence, that book has been chosen as this month’s Book Club selection at her local Barnes and Noble in Beaumont, Texas. What are the chances? Of course, I downloaded it immediately and just finished reading the book this morning. A fascinating multi-generational tale of historic fiction, based on ethnographic and historical research (Lisa See is magnificent at that kind of writing), I couldn’t put it down. 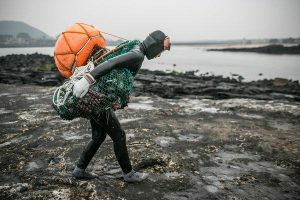 The haenyeo (women divers) of Jeju go to the sea to feed their families, leaving the men to raise the children and tend the home. (Of course, there is always work to be done around the home for the women, when they return from their diving:). 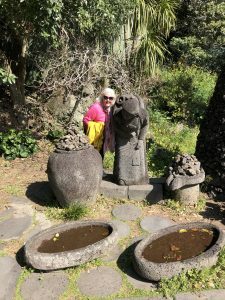 This is a photo of me with a statue of one of the women of Jeju Island. 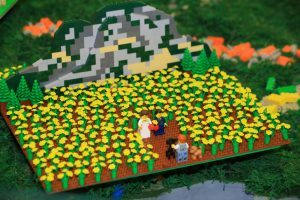 In this matrifocal society, the women do most of the manual labor – diving, gardening, carrying the water – while the men care for the children and the home. The story revolves around the relationship of two women, Young-sook and Mi-ja, spanning their childhoods through old age. Along with the development of their relationship, the story also gives great insight into the history of this country that I will call home for the next couple of years. It is a fascinating read and I highly recommend it. These are not my photos of the Haenyeo. But, they are so fascinating, I wanted you to get a look at them. I am anxious to return to Jeju Island to watch them at work. Prior to the 1960s, the women wore light cotton outfits, tied on the sides, to dive. The water temperature can be quite cold (7c or 45f). We spent the rest of the day exploring the island. 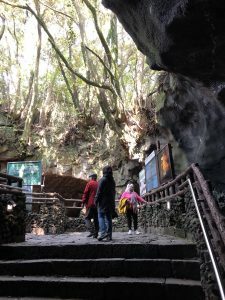 UNESCO Heritage Site – Manjang Cave, Cheonjeyeon Falls, and Jusangjeoli Hexagon Lava Cliff. We drove through pine forests, green tea fields, tangerine orchards, fields of forsythia, streets lined in camilla and cherry trees, and hillsides planted with onions, garlic, potatoes and carrots. Each plot was fenced with hand-stacked basaltic lava rocks in neat, well tended plots. 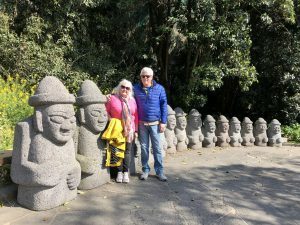 Those rocks are said to tell the story of the people of Jeju. 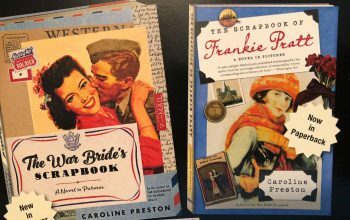 (As an aside to my reading teacher pals – it meant so much more to me to have seen these plots when I read about them later in the book. We know the importance of that life-to-print connection so well). I could see, in my mind’s eye, exactly what it looked like when Young-sook and Mi-ja met in the fields over the course of their lifetimes. Mack and I had lunch with our driver in a local spot, dining on all sorts of things that I didn’t recognize. Hot pots of rice and abalone were the main course, but we were also regaled with several kinds of kimchee, raw abalone, sliced paper-thin, potatoes and sweet potatoes in a variety of dishes, and a yummy potato pancake that we tried to eat with stainless steel chopsticks (much more difficult and slippery than the bamboo ones that we are used to). We did not, however, go hungry. We enjoyed that pizza and “grandfather” so much on Friday night that we repeated the menu on Saturday night. 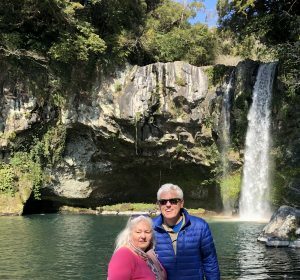 Exhausted from climbing up cliffs and hiking through caves all day, we decided to forgo our usual wild Saturday night partying (yeah, sure). 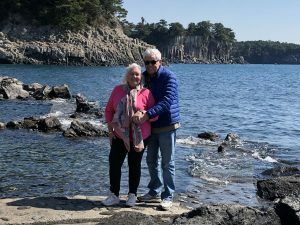 A quick trip in reverse on Sunday – bus, plane, subway – back to the hotel in Seoul left us with great memories and plans to go back to Jeju when the weather is warmer. Mack returned to work on Monday and I returned to my book. A great way to spend a few days, for sure! 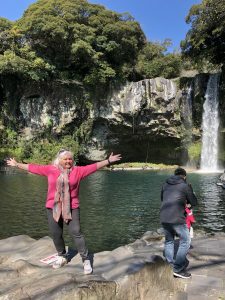 The Jeju word Halmang means both grandmother AND goddess. I like that!